It is hard to put the 137 kilometers or so that make up the highway between Lagos and Ibadan into words. It is hard to do that crazy thing justice even with pictures because it is not just a paved road for cars, busses and trucks to drive on- no- it is a living, breathing and ever changing force where anything is possible. This two-way highway connecting Ibadan and Lagos is believed to be the most dangerous highway in Nigeria. It is not a trip to be taken lightly, although some Nigerians do it often. At a time with no traffic, car accidents or the occasional death, the commute will take around an hour and a half. When one of the latter occurs, the ride could easily be 4- 5- hours, or the whole day. Motorists and commuters have been known to sleep on the highway. It's hard to get a picture of the beauty on the side of the expressway when you are shooting through a window and being jostled nonstop due to the pot holes. The scenery surrounding the road varies. A good 60 percent of what you see out the window (if you are in a vehicle where you actually can see out a window) is undisturbed green jungle. 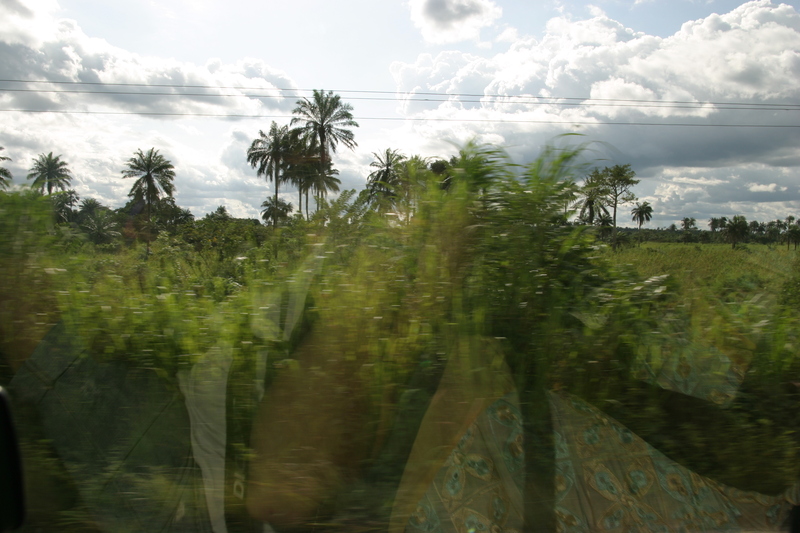 On either side of the highway, all types of tropical flora fill the land all the way to the horizon. 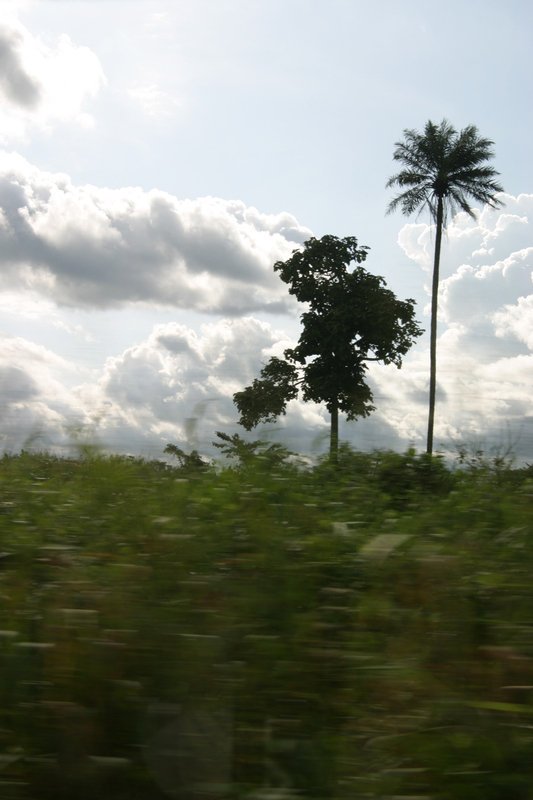 The palm tree towers above the dense green floor below on the side of the Lagos-Ibadan Expressway. There are tall trees with thin trunks and umbrella like branches. Sporadic palm trees tower above a mass of luscious greenery. High green grasses that hug the road billow from the cars whizzing past. It is breathtaking. Then, about 30 percent of what you see out the window is what I would call organized squalor. It’s young people holding boxes of snacks, towers of CD’s, bags of eggs, racks of meat. At times, the cars need to slow down because of traffic or pot holes, giving the sellers the chance to get right up next to the cars. They shimmy through traffic, eyeing passengers in every car hoping for the slightest glance that indicates the person is wants to buy. If they get lucky the passenger will grab whatever he wants out of the box and if traffic happens to start moving, the seller will run along side the car waiting to collect his hard earned money. The rest of the landscape in these highway towns is women cooking over open fires, with a babies tied to their backs. It’s countless broken down trucks with men wedged underneath, hands covered in oil. It’s small shops selling the most random objects. It’s filled with pungent smells of exhaust and sounds of cars honking. It’s daily life and a community for hundreds of Nigerians. The last 10 percent of sights have to do with prayer. Numerous hard roofed-open air establishments called Prayer Cities are located on the expressway. These tent-like structures can accommodate thousands of Christians and Muslims who come to pray there on the weekends. On the last Friday of every month it is not possible to drive on the road because the Prayer Cities are so flooded with people. In addition to Prayer Cities, religious compounds are on the way. The Redeemed Christian Church of God and Mountain of Fire and Miracles are two of the huge camps where devoted people live and pray. Needless to say, there are enough shocking things to look at off the road, but you could easily spend the entire ride looking at the road and be just as entertained. Mini-busses (essentially big taxis) packed with people (some people literally hang out the windows), flat beds carrying huge loads of logs, chairs, cows, people, etc., oil-tanker trucks, cars and little motorcycles (called Okadas) weave around pot holes at glaring speeds. Someone is always honking a horn somewhere because lane markers do not exist. Vehicles honk to tell the one they are approaching, “hey! I’m coming up behind you, get the hell out of the way!” It is quite effective but if the beep isn’t enough, the window roll down and curt shouting does the trick. When I told my host family I was traveling to Lagos for a night, they said, ‘By the Grace of God you will make your trip peacefully.” When I heard this I didn’t think much of it–people here make references to God all the time, its something I’ve come to accept. But after I actually experienced the treacherous, wondrous, chaotic place that is the Lagos-Ibadan Expressway, I fully understand why my family made such a comment. All I can say is, thank God we had an excellent driver. Bawo ni? Just reading your blog after a while. Your writings make me miss home. I hope you’re really enjoying the experiences and that they’re enriching your life. Thanks for posting the photos. The clean clear skies reminds me of that luxury that is unattainable in the U.S. state I reside in. There’s so much smog, sometimes you can barely take a good breath. The traffic in CA is just as bad as that in Naija and the 405 is supposed to be the worst freeway for traffic in the U.S. When I’m home I simply laugh when they complain about traffic. Let them try being on the 405 or 91E when traffic is horrible and when some oil tanks have spilled oil, trucks have been overturned by the Santa Ana wind or someone has committed suicide or been shot on the freeway, you may just spend the whole day there. I always say at least in Naija you can do your shopping, enjoy and comment on the scenery (whatever it may be and depending on where you are) and also get entertained while you’re stuck in traffic on the freeway. …And if you’re lucky to have a driver, which most people do, you can additionally catch up on much needed rest, eat, read or catch up on your phone calls. You make me miss Niaja. well, off I am to read another of your entries. Ba mi ki awon olutoju e o.